July 3rd Live Stream, Zelda Games, Discussion, Trivia and Prizes! Tomorrow here at Zelda Dungeon, we will be hosting a Live Video Stream right here at the site. It is set to begin at 1pm US Eastern Time, which is 10am US Pacific Time, and 5pm GMT. 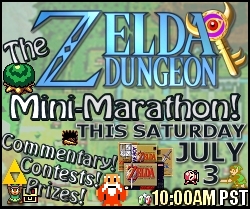 The Video Stream will consist of of various segments, starting off with a 4-Zelda Game mini-marathon. We will be playing the first four main Zelda titles (Legend of Zelda, Adventure of Link, A Link to the Past, and Link’s Awakening), with the goal of a total completion time of 10 Hours. During the stream we will be providing audio commentary where we will talk about the games we are playing, provide Zelda discussion, and answer your questions live. There will be an embedded chat room right next to the video where you can chat right along with us. Immediately following the mini-marathon, we will be hosting a Zelda Trivia Quiz. How this will work is that we will set a designated time in which we will start the quiz. It looks to start roughly 10hours following the start of the actual stream, so… 11pm US Eastern Time. (There is likely to be a secondary time at a later date for those who could not make this quiz time). At this point we will then make the quiz page accessible to all fans who are viewing the site at the time. You will have to register, providing your name, e-mail, and some personal information that we will need to collect in order to be able to give out prizes, while also ensuring that we prevent any people from cheating during the quiz. After some short forms, you will then start the Zelda Trivia Quiz! It is a TIMED quiz in which you will have 10 minutes to complete the quiz of 20 questions. There will be questions grouped in ‘easy’, ‘medium’, and ‘hard’ lists, and each member will be asked a certain number of questions from each group. They will be multiple choice questions with 5 answer choices for each question. After the quiz time has ended, we will go through ALL of the questions live on air and reveal the actual correct results. We will be giving away prizes for those who score the best on our Zelda trivia quiz, as well as random prizes to any users that participate. We will have a large pool of prizes which will include Zelda games, Posters, Figurines, DVD’s, and other Zelda related prizes. However, if certain milestones are reached at our Facebook and YouTube accounts (see below), then larger prizes such as a Nintendo Wii or Nintendo DS game of your choice will be tossed into the prize pool. There is also the possibility of grand prizes including that of a Nintendo DS and Nintendo Wii console if certain milestones are reached. The top winners of the trivia quiz will get their first choice of a prize from the pool of prizes, and it will work its way down. A handful of smaller prizes will also be given out to random members who participated in the contest, so even if you don’t know your Zelda trivia, simply participating gives you a chance to win some nice goodies. As of this post, we currently have 3,134 fans at the Zelda Dungeon Facebook Page and 7588 subscribers at the Zelda Dungeon YouTube Account. Listed below are the appropriate milestones needed in order to reach each of the larger prizes. 1. You must provide personal information so that we can actual ship out your prize winnings. 2. You must be a Registered Forum Member at Zelda Dungeon and make at least 20+ posts within two weeks of winning. 3. For grand prize winners, a picture of yourself with your prize would be appreciated once it arrives! It surely is going to be one exciting day for myself, as well as the entire Zelda Dungeon team. Be sure to join us tomorrow for some Zelda games, discussion, trivia, and a chance to win Zelda prizes! We look forward to seeing many of you here.